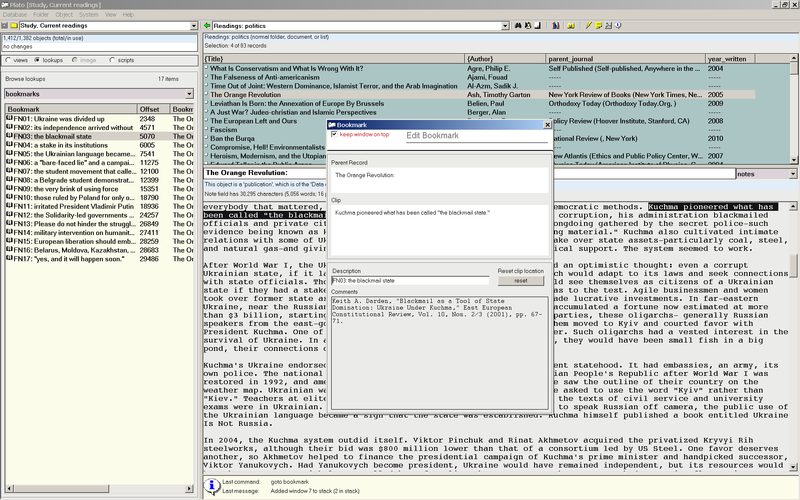 This screen shot shows a view of Plato's bookmarking feature. Bookmarks are easily created as you read--simply highlight a phrase and right click your mouse for the text pop-up menu, then select "bookmark" or "bookmark and comment." A bookmark will be created and added to the bookmark list (shown at left in the screen shot). If you selected "bookmark and comment," the bookmark pane (shown at the right of the screen shot) will also open and allow you to write comment or notes that will be attached to the bookmark. You can include bookmarks in your document building scripts, where they may appear as footnotes, endnotes, or margin notes (depending on the abilities of the markup language you use to build your document).